It was a gorgeous early summer day in Brooklyn, the sky clear and deepest blue. Some neighborhood parents had decided to take the kids to Prospect Park on a nature walk. The little ones were in perfect moods–darting about together, holding hands, giggling– just reveling in the warm air kissing their skin and the cool breeze ruffling their hair. They seemed so happy to be alive and outside. Jack was just a few months old and had evolved into a smiley, wriggling package that other people delighted in bouncing and holding, and I remember the joy I felt as I walked, my arms swinging free for the first time in what felt like ages. As we wandered near the Audubon center, the children stopped, delighted. Just feet from us was a majestic family of Prospect Park swans, gliding serenely by. The children stood near the water and admired the long-necked, glistening white creatures as they escorted their fuzzy little flock on a sweet pleasure cruise. They calmly floated in a straight line, parents at the head and the foot, with the teeny perfect fluffy gray cygnets spaced evenly between them. I stood a few feet back from the kids and half-listened to their cheerful burbling as they stood admiring the bucolic scene. My heart fizzed with happiness as I breathed in the beauty of the day and the moment. I felt so lucky to be there with my two children, the sun glinting on the water and this lovely natural scene unfolding for the most cozily perfect teachable moment that one could hope for. And then a rush of water and in a horrifying swooping instant every hair on my body stood up on high alert as I watched one of the swans leap out of the water and menacingly plant itself in front of Zeke. It was making this spine-chilling hissing sound and stood with wings outspread just inches from my little boy. I sprinted over to Zeke and clutched him in my arms, and I found myself face to face with the swan. It was as tall as I was, its wings spread at least three feet to either side of me and I had the horrible sense that it could have gathered Zeke and me up in those wings and crushed us. It kept striking at us viciously with its head and hissing. Its bill was blunt, stabbing, missing by mere millimeters each time. I was terrified. Instinct told me not to put my back to it, so I stumble-ran backwards, awkwardly, one arm clenching Zeke, the other in front of me in some vague attempt to keep the swan back. I was convinced that once I was sufficiently out of range of the cygnets, that the swan would retreat. But my instincts were wrong. The swan kept coming at us, striking, its wings pushing, pulsing powerfully. I soon realized that while carrying a screaming toddler, and attempting to run backwards, I was never going to get away from this thing. it was clear that I was no match for this beast. I was flooded with panic, and as my mind scrambled desperately, searching for my next move, my vision filled with the image of a little black backpack swinging hard and connecting solidly with the swan’s head. A good Samaritan had seen the attack and rushed in, backpack swinging, to help me and my child. 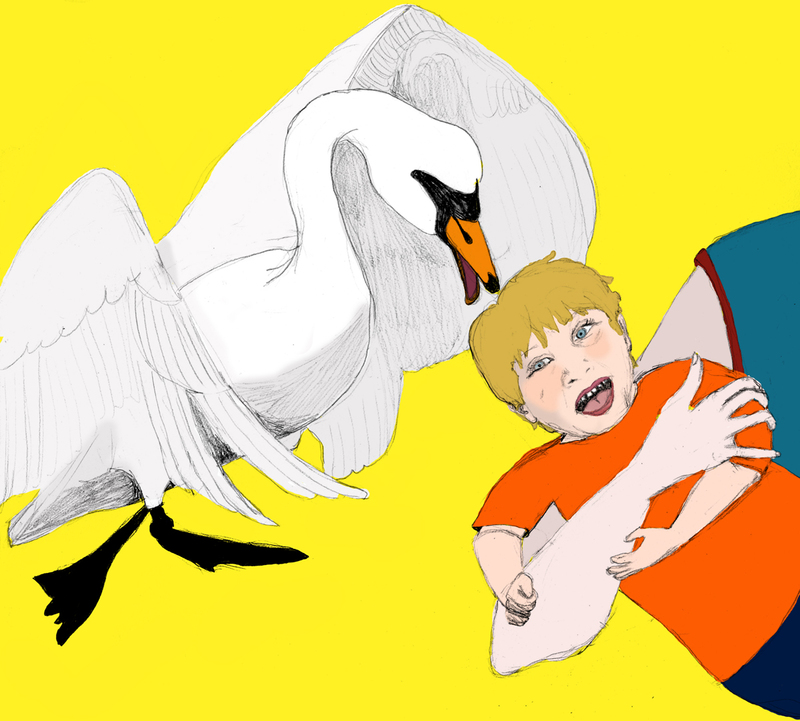 The swan spun around in fury and chased the woman. I saw it strike viciously just inches from her as she ran away. I took advantage of the diversion, clung tightly to Zeke and blindly ran as fast as I could away from there. I was panting and sweaty and every fiber in my body was tingling with adrenaline. I held my baby close and made soothing noises in his ear. I never saw what happened to the woman who helped us. Never thanked her. And none of us really enjoyed watching the swans anymore. Zeke would hide his face behind my hip when he saw them, and to me some of their grace was lost. They no longer looked so immaculately white, I only saw how many of their feathers were dingy and yellowed. I couldn’t focus on their slow even movement, just on the cruel way they nipped at the little mallards and snatched every last crumb of tossed bread. I would totally put the bamp on someone.